hells_half_acre | Flights Booked! Fantasy=Reality! I have now booked my flight(s) to Asia! My travel plans are now SET IN STONE! (or at least electronic file storage on airline computer servers). 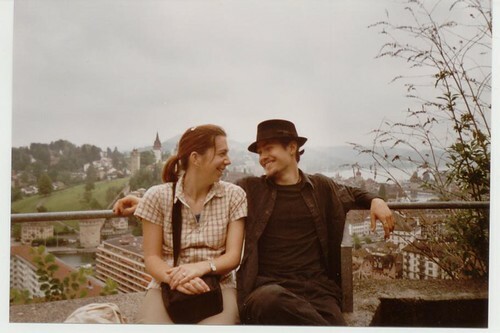 Above is a picture of Gabe and Sarah, back in 2003, during a little class trip down to Luzern, Switzerland. They are posing as part two of what Gabe calls "The Princess Di and Prince Charles pose." (part one is them looking away from each other and clearly looking miserable). Who knew, that six years later, I would be flying across the pacific ocean in order to visit them. Gabe is in China, as you all know by now, and Sarah is teaching in Singapore with her husband (who happens to also be a friend of mine). So, I have booked 3 of the four flights that I will be taking between January and March. I'll be starting my Asia tour in Shanghai, and ending it in Singapore, all that remains to be purchased is my plane ticket between the two countries, but I'm going to wait until I'm in China to do that. I'll be gone from January 22nd until March 11th. A little longer than my original "one month" plan, but honestly, who can blame me. Also that includes a stop in Vancouver to see my sister Susan, and hopefully also a jaunt down to Seattle to see my sister Emily. I'm very excited! A little bit nervous - because things always make me nervous when I realize that they are actually going to happen. Overwhelmingly excited though. I just hope that despite my crappy job, I can earn enough money to have a good time. In truth, my plane tickets were much cheaper than I thought they would be...almost half as much as I was expecting. "Great Alix! You can save money!" is probably what you are thinking, but that's not where my mind went...my thought was "Wow, I might have money left over...you know...they have pretty cheap flights sometimes between Ottawa and Frankfurt...."
So, here's what I'm thinking now: ASIA TOUR January 23rd-March 11th, followed perhaps closely by TRIP TO GERMANY TO SEE SHERRIE! possibly in April, possibly in June...depends on a few factors, such as "is Sherrie even around then?" And "do people going on trips need me to house sit?" As well as, "do I even still have a job?" But 2009 could be the year of visiting my long-lost friends! It'd be so much fun!